There are a million local cafes. But what's the difference between them? Turns out it's the way their coffee is roasted. Catahoula's Timber Manhart learned to roast by trial and error. It's not entirely hyperbolic to say that the Bay Area has more coffee shops than god. According to the market research company NPD Group, the San Francisco/Oakland/San Jose region has 1,379 cafes — or about 2 for every 10,000 folks. In the immediate Bay Area, that's more dispensaries of caffeine than public schools. Thanks to the so-called "Third Wave" coffee movement, local residents today have a broad range of specialty shops to choose from, and customers can be fiercely loyal to one cafe over another (Google "SF Coffee Wars"). But just how different are they from one another? What really separates them? Turns out, it's mostly in the roasting. We say "mostly" because of course there are other variables that go into how a coffee ultimately tastes: the quality of the green beans, how fresh the coffee is, how it's prepared, the temperature of the water used, etc. But when it really comes down to it, the biggest difference between Neighborhood Cafe A and Neighborhood Cafe B is in the way its beans are cooked. "Most roasters — maybe some of them won't admit it — but I think everybody gets something from Royal," said James Freeman, owner of Blue Bottle. "People say brokers, middlemen have a bad reputation, but Royal is so good. ... They're total straight shooters." Some of these roasters have their own retail outlets (Blue Bottle, Peerless, Catahoula) but most earn their keep by selling wholesale to cafes and restaurants: Peerless Coffee & Tea to Bay Wolf Restaurant, Four Seasons hotels, World Ground Cafe, Boudin Bakery; Mr. Espresso to several hundred undisclosed local cafes and restaurants; Blue Bottle to several dozen; McLaughlin to Cole Coffee, Cafe Strada, Berkeley Espresso, Jump'n Java, Royal Grounds; Flying Goat to Local 123, Cafe Zoe, Bica Coffeehouse, Modern Coffee. In other words, a lot. Roasters differentiate themselves not only by their roasting philosophy and technique but also by the beans they choose and the blends they create. 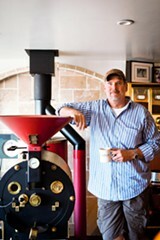 Most use gas-fired roasters (an exception is Mr. Espresso, which uses wood). As for what's the best way to roast, well, that's fairly subjective. Everyone has their theories and preferences, but the aim is to bring out the best flavor profile of each bean, usually based on its origin. Beans from different regions and even different farms can have varying characteristics, say roasters. McLaughlin Coffee's Mike McLaughlin says if his beans from Kenya are roasted too dark, it'll kill their taste. His Mexican Organic, on the other hand, can take more heat. "You want to make sure you don't roast the origin out of the coffee," he explained. Mr. Espresso's John Di Ruocco says beans with high acidity (like Colombian and high-ground Guatemalan) can take a dark roast and still have some sweetness left. Whereas he roasts Ethiopian very light in order to keep its "floral, tropical fruit notes — even though it has quite a bit of acidity." The roasting process itself appears, at least on the surface, to be far less complicated than one might think. 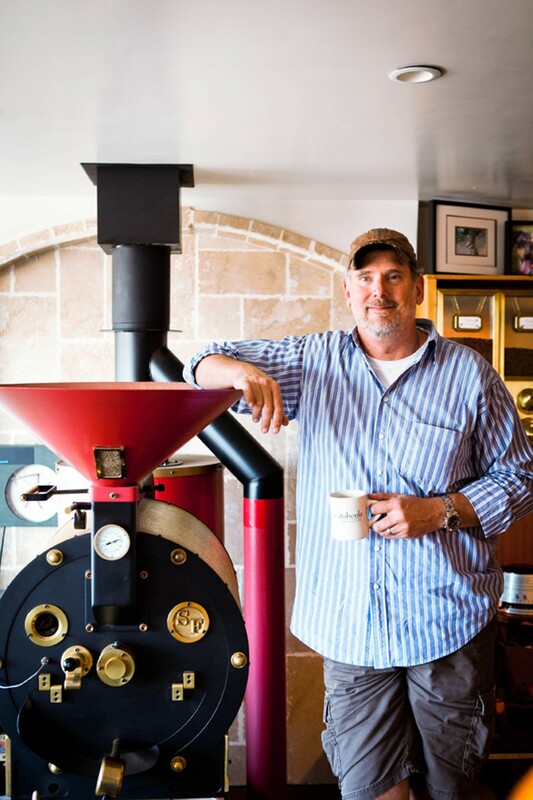 On a recent morning in Richmond, Catahoula Coffee owner Timber Manhart showed off his cute 25-pound gas-fired steel drum roaster. Beans are poured into a hopper before draining into the roaster, where they're churned around in temperatures somewhere near 400 degrees. (Manhart calls it a "glorified clothes dryer.") The whole process doesn't take long — his roasts (which err on the lighter end of the spectrum) last between fifteen and eighteen minutes. The difference between minute fifteen versus minute eighteen is astoundingly significant. "Between one and three minutes, you can have a completely different roast," he said. He checks on the beans periodically via a sampler, a tiny scooper that pulls a small amount of beans from inside. They start off a greenish yellow, then caramelize to a peanut color and finally to a light milk chocolate. In the process, the beans make two distinct popping noises, like miniature popcorn. When they're done, they're dropped into a round perforated cooling tray, with mechanical sweeper arms that stir the beans while air is sucked through the bottom, for five to ten minutes. Once cooled, they're dropped into a bucket, bagged, and left to "de-gas" for 24 hours before being sold. There are many variables that can affect the beans during roasting: like how much air is circulated, how high the temperature is and how it's maintained, how long they're roasted, and how often the roaster is cleaned. But, relatively speaking, Manhart says there's no wrong or right way to roast. "If you ask five different roasters you'll get seven different answers," he joked. Manhart, who arrived to the roasting game late, learned by trial and error. He says his $40,000 roaster came with only one page of instructions. Lately, roasters have been moving away from the dark, oily roast that Peet's popularized. Most specialty roasters these days aim for that light milk chocolate color, which results in a sweeter, livelier flavor. "We've been trying to slowly introduce the idea that coffee can have its own inherent sweetness, it can have its own inherent body, and you don't need milk," said Phil Anacker, co-founder and green coffee buyer for Flying Goat Coffee, based in the North Bay. "Slowly but surely we're converting people to the idea." Consumers looking for a particular roast need to use caution when ordering it, because the names of the varying degrees of roasts differ depending on whom you ask. (Contrary to popular opinion, French roast does not refer to any kind of bean, but rather the amount of time those beans are roasted; it's usually a blend on the darker, oily side.) Manhart says his light to dark roast names are: city roast, full city, Viennese, French, and Italian (his roasts hover in the full city range, in which the skin of the bean remains wrinkle-free and its essential oils are retained). Mr. Espresso's Di Ruocco says Italian is considered lighter than French on the West Coast, while it's the opposite on the East Coast. They do French roasts, mostly, and even when they do Italian roasts, they call them French roasts. Even what's light and dark is subjective. When asked why he roasts his coffee on the lighter side, Blue Bottle's Freeman replied, "There's other roasters who would say your coffee is unbearably dark. That's more of a subjective value judgment. We roast coffee the way we like it." While many roasters get their green beans from Royal, increasingly, many are starting to direct source their beans from farmers. Flying Goat Coffee's Anacker says they source about 80 to 85 percent of their green beans that way. Peerless Coffee & Tea direct sources the vast majority of its coffee, too. That means they have a green bean buyer who travels around the world meeting with farmers, tasting their beans, and setting up contracts. In some cases, once buyers choose their farmers they hand off the logistical process to Royal. Direct sourcing means a lot more work for the roaster. But it's a way to ensure that the coffee is sustainably grown and harvested in the most ideal way for the roaster. It's also a way to brand one's coffee as more specialty than your neighbor's. Ultimately, however, Manhart views the whole coffee snobbery as a bit silly. "It's all marketing, it's all image," he said about different roasters. "We take coffee seriously; not ourselves."